PURPOSE: Surgical site infection is a major cause of increased post-operative morbidity. The surgical drape functions as a barrier between the surgical field and the potential sources of microorganisms in the environment and operating room personnel. The extent to which the materials act as barrier depends on the closeness of the weave and water-resistant properties of the fabric. This is an in vitro study to evaluate the ability of different types of surgical drapes to prevent bacterial strike through. MATERIALS AND METHODS: Four types of fabrics used as surgical drapes were tested for their ability to prevent strike through when exposed to different bacteria for varying spans of time. We tested the drapes with Staphylococcus aureus, Escherichia coli and Pseudomonas aeruginosa. 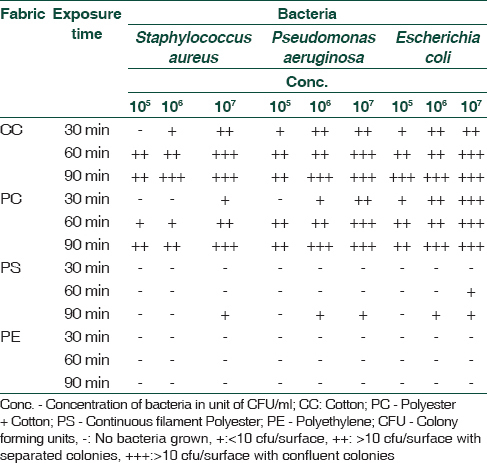 RESULTS: Drapes made of cotton (CC) or polyester-cotton (PC) textile exhibited least resistance to bacterial penetration. Disposable woven continuous filament polyester fabrics showed better resisting powers. The disposable non-woven polythene fabrics were found to resist bacterial penetration most effectively. The penetration through the woven fabrics was found to be dose- and time-dependent. CONCLUSION: The practice of using reusable textile clothes as surgical drapes should be discontinued and be replaced by non-woven seamless disposable fabric. Surgical drapes should be tested for their penetrability before introducing in operation theatre. Surgical site infections (SSIs) are one of the major causes of post-operative morbidity. The importance of techniques and procedures to minimise SSI cannot be overemphasised. All preventive measures starting from operation theatre (OT) room sanitisation and surgical scrubbing to a clean, aseptic operation procedure and antibiotic prophylaxis are aimed to achieve this goal. However, SSI continues to be a major cause of post-operative morbidity. The burden of SSI in developed countries is estimated to be around 1.9%–5% of the in-patient surgeries , and contributing to 31%–38% of all nosocomial infections., It is much more in resource-constrained developing countries where modern methods are unaffordable or unavailable. In India, various studies had put the incidence between 2.5 and 41.9%., In addition to increased morbidity and surgical failure, post-operative wound infections may also lead to an increase in the length of hospital stay of the patient and may be a cause of economic burden to the patient. One of the sources of infection that can occur during the operation procedure is through the surgical drapes.,, The following in vitro study was undertaken in a tertiary healthcare teaching hospital to evaluate the ability of different types of surgical drapes to prevent bacterial strike through. The aim of this is to evaluate four different kinds of surgical drapes for their ability to resist bacterial penetration using different bacterial strains. A method adopted by Blom et al. was used with a little modification., The different types of drapes used were tested for their ability to resist penetration by different types of bacteria on exposure to variable spans of time. Surgical drapes made of four types of fabrics were used for this study: (1) Woven cotton, reusable, textile fabric, washed and autoclaved (CC), (2) Woven polyester – cotton, reusable, textile fabric made of 50% polyester and 50% cotton, washed and autoclaved (PC), (3) Woven, disposable, sterile, continuous filament polyester (PS) and (4) Unwoven, disposable, sterile polyethylene (PE) fabric. Under sterile precaution, each of the fabrics was cut into sizes sufficient to cover surface of 50-mm diameter Petri dish More Details. Most of the SSIs are caused by staphylococci, Pseudomonas and members of the Enterobacteriaceae family. Hence, we have chosen representative members of these organisms. Fresh broth cultures of Staphylococcus aureus(ATCC 25923), Pseudomonas aeruginosa (ATCC27853) and Escherichia More Details coli (ATCC25922) in peptone water were prepared. They were serially diluted to achieve concentrations of 1 × 105, 1 × 106 and 1 × 107 colony-forming unit (CFU)/mL for each bacterium just before inoculation. Culture media: We used Petri dishes of 50-mm diameter filled with nutrient agar to half thickness and next filled to the brim with 5% sheep blood agar (BA). A set of 3 Petri dishes were assigned and labelled for a single bacterial concentration to be used for a single fabric. One each of the Petri dishes was earmarked for an exposure time of 30, 60 or 90 min. In total, 108 bilayer Petri dishes were used for a single test run. Test procedure: Each fabric was tested for different concentrations of test organisms by exposing them to different time spans. The method is illustrated in [Figure 1]. Pieces of each fabric were placed on BA surfaces of 27 plates (arranged in a 3 × 9 panel). Each of the concentrations was inoculated onto a set of 3 Petri dishes. To inoculate, 100 μl of the broth culture from each bacterial aliquot was dispensed evenly on the fabric spread over the BA surface. After 30, 60 and 90 min of exposure time the fabrics from respective plates were removed and the Petri dishes were covered with a lid and incubated at 37°C. On completion of 24 h of incubation, the Petri dishes were inspected for growth of bacteria. The growths were graded into a scale of “-,” 1+, 2 + and 3+ (“-” = no growth, “1+” = 1–10 colonies, “2+” = >10colonies, but are separate and “3+” = confluent colonies). The test process was repeated to verify reproducibility of the results. The results are summarised in [Table 1]. It was observed that the bacterial strike through in the fabrics made of PE is nil even for long duration of time (90 min). Fabrics made of woven PS were able to resist bacterial penetration satisfactorily for short durations (30 and 60 min) but showed some degree (1+) of penetrability when the exposure time is increased to 90 min. The textile fabrics made of CC or PC offer little or no resistance. CC fabrics are least satisfactory among all resisting only low concentration (105 CFU/ml)) of Staphylococcus aureus for 30 min. Woven PC is relatively better than CC when the duration of exposure is small, for example, 30 min, but on long-duration exposure, it behaves similar to CC. All the woven fabrics allowed passage of bacteria tested when exposed in high concentration for longer duration. Among the tested bacteria Escherichia coli and Pseudomonas aeruginosa showed no difference in their penetrability behaviour; whereas Staphylococcus aureus was relatively less penetrating than them. Again, as the concentration of bacteria increases from 105 to 107 CFU the bacterial strike through rises proportionately. The above results show that woven and reusable textile fabrics made of CC or polyester – CC offer little resistance to bacterial strike through. This was understandable because of the existence of pores in woven fabrics. The disposable woven, PS fabrics have better resisting powers than the reusable textile fabrics; this may be due to the relatively smaller pore size of the continuous filament fabric. Plastic drapes made of PE are good barriers. This is probably due to the non-porous nature of these materials and the hydrophobic or non-wettability nature of these fibres – more wettable the drape more chance of bacterial strike through. Furthermore, it can be inferred that the amount of bacterial strike through was time- and dose-dependent, particularly when using the woven materials. Longer exposure time or higher bacterial concentration increases the bacterial penetration. We have observed that Escherichia coli and Pseudomonas aeruginosa showed more penetrability than Staphylococcus aureus. This might be related to the motility of these bacteria; motile bacteria being on a more advantageous position. Garibaldi et al., in a controlled clinical trial had taken 2 groups (1st group using woven reusable drapes and the 2nd group using non-woven disposable drapes) and studied their ability to act as a barrier to intraoperative wound contaminations. They had observed that there was no difference between the two study groups in either the frequency or level of intraoperative wound contamination as judged by cultures of specimens collected at the time of wound closure. However, that study did not take into account the chance of infection arising from environmental bacteria that can strike through the drapes. We had taken Pseudomonas aeruginosa as a test organism which is one of the dreaded causes of nosocomial infection and is commonly present in the hospital environment, rather than as a normal microbial flora of patients. The duration of the operation procedure and the bacterial load in the environment are other factors which can affect the degree of penetration. The practice of using woven fabric as surgical drapes or gowns should be discontinued and should be replaced by sterile, non-woven, lint-free and disposable fabric. They should be impervious and free of tears, punctures or holes. Although the use of non-woven seamless disposable fabric will increase the initial cost to the patient, this cost will be likely offset by reducing the risk of SSI, limiting the hospital stay and the associated human-hour and financial loss. We suggest that in operations of long duration, changing the soiled drapes should be considered. Drapes should also be rigorously tested for their bacterial penetrability before being introduced in the OT. Anderson DJ, Kaye KS, Classen D, Arias KM, Podgorny K, Burstin H, et al. Strategies to prevent surgical site infections in acute care hospitals. Infect Control Hosp Epidemiol 2008;29 Suppl 1:S51-61. Surgical Site Infection (SSI) Event: Procedure-associated Module. Available from: https://www.cdc.gov/nhsn/pdfs/pscmanual/9pscssicurrent.pdf. [Last accessed on 2017 Apr 19]. Lilani SP, Jangale N, Chowdhary A, Daver GB. Surgical site infection in clean and clean-contaminated cases. Indian J Med Microbiol 2005;23:249-52. Anvikar AR, Deshmukh AB, Karyakarte RP, Damle AS, Patwardhan NS, Malik AK, et al. A one year prospective study of 3280 surgical wounds. Indian J Med Microbiol 1999;17:129-32. Whyte W, Hamblen DL, Kelly IG, Hambraeus A, Laurell G. An investigation of occlusive polyester surgical clothing. J Hosp Infect 1990;15:363-74. Association of Surgical Technologists Standards of Practice for Surgical Drapes- Authored by AST Education and Professional Standards Committee and Approved by AST Board of Directors-2008. Available from: http://www.ast.org/uploadedFiles/Main_Site/Content/AboutUs/Standard_Surgical_Drapes.pdf. [Last accessed on 2015 Jul 29]. Mangram AJ, Horan TC, Pearson ML, Silver LC, Jarvis WR. The Hospital Infection Control Practices Advisory Committee. Guideline for prevention of surgical site infection. Infect Control Hosp Epidemiol1999;20:247-78. Blom A, Estela C, Bowker K, MacGowan A, Hardy JR. The passage of bacteria through surgical drapes. Ann R Coll Surg Engl 2000;82:405-7. Blom AW, Gozzard C, Heal J, Bowker K, Estela CM. Bacterial strike-through of re-usable surgical drapes: The effect of different wetting agents. J Hosp Infect 2002;52:52-5. Mackintosh CA, Lidwell OM. The evaluation of fabrics in relation to their use as protective garments in nursing and surgery. III. Wet penetration and contact transfer of particles through clothing. J Hyg (Lond) 1980;85:393-403. Blom AW, Barnett A, Ajitsaria P, Noel A, Estela CM. Resistance of disposable drapes to bacterial penetration. J Orthop Surg (Hong Kong) 2007;15:267-9. Garibaldi RA, Maglio S, Lerer T, Becker D, Lyons R. Comparison of nonwoven and woven gown and drape fabric to prevent intraoperative wound contamination and postoperative infection. Am J Surg 1986;152:505-9. Guidelines for Prevention of Surgical Site Infection; 1999. Available from: http://www.cdc.gov/hicpac/pdf/guidelines/SSI_1999.pdf. [Last accessed on 2016 Nov 10].